Inspired by the marbleized fall shades of the mark. Eye Dream of Glam Ultimate Eye Shadow palette (I don't think I've been this excited about eyeshadow. Ever. ), I wore this outfit to the Uniqlo opening soiree last week. 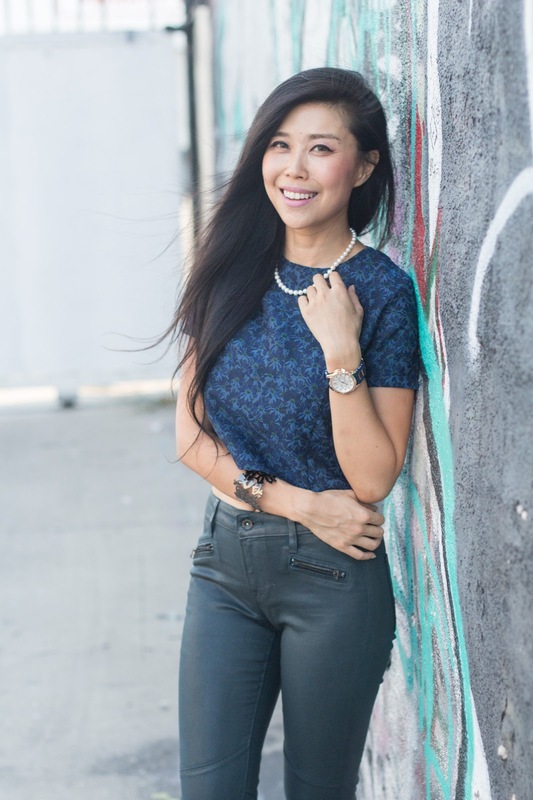 Pairing jeans with pearls is a new look for me and one that I'll try again as the contrast between prim and proper and LA casual epitomizes my everyday style! Speaking of pearls, I've committed to the #3DWhiteSmile challenge. For the next two weeks, I will be using Crest 3D White Whitestrips Luxe Supreme FlexFit to whiten my teeth which claims to whiten as well as a $500 in-iffuce professional treatment. The FlexFit technology allows Whitestrips to stretch and mold to custom fit your smile for superior coverage and provides 30% more coverage to whiten more teeth. Can't wait to share my results! I love this look. That crop top looks great on you! Great look! I find it interesting that a pearl necklace can actually match so well with a casual chic outfit! Thanks for the inspiration! I love the reading! That subject is very rare to find out and seem you’re effort much on that. Incomparable write up! Gorgeous bangle bracelet, reminds me of my favorite silver bangle by ELLE Jewelry Damask Collection.